A Radicle: The Natural Products Industry that Isn’t. The Natural Products Industry that Isn’t. A few evenings ago I was sitting on a rough cedar deck, watching sunlight orange across the tops of the poplar and maple canopy, and thinking how nice it was to be visiting my friend’s house in the forest: the nestled feeling, the total privacy, the familiar smells. He confessed that, sometimes, he too liked to imagine his house from the perspective of a guest, walking through his gardens, up the wooden steps, and into the kitchen with the eye of an outsider, taking the time to appreciate it without the preconceptions and perceptual habits that develop after living in a place for an extended period of time. Perhaps it was the effects of the mixture of Schisandra kombucha, gin, and tonic water we were drinking, but this short exercise in mindfulness seemed to me as both a useful habit to practice and also a profoundly important skill for the modern human. We are so entrenched in our politics, our communities, our niches and worldviews that, without occasionally looking at life from outside the fences, we might run the risk of missing out on an important and useful perspective. I have also been thinking a lot about the Food and Drug Administration recently. Don’t get me wrong – there are serious issues around funding, connections to the food and pharma lobbies, and separation from nature that continue to concern me about this regulatory body’s work. But I have been trying to walk these familiar corridors (herbalists versus the FDA) with an outsider’s eye. In the last year, there have been more and more inspections of natural product manufacturing facilities. The government is trying to identify “new” dietary ingredients and regulate their use. There is both clamor and confusion rising up from those who make and sell products that are used under the umbrella of “complementary and alternative medicine”. What is going on here, and why? What might we learn by observing the situation? Out of these annual sales, herbal products account for about five billion annual dollars, or just under 18% of the total. Within this five billion, it is hard to assess what percentage of products are made from refined, concentrated botanical constituents (such as curcuminoids, or silymarin) versus crude whole-plant encapsulations, tea blends, and tinctures – but suffice it to say, the bulk of that five billion annual dollars is not finding its way into the pockets of small-scale, heart-centered local herbalists! So, in sum, at least 82% and probably over 90% of what makes up the “natural products” industry isn’t “natural” at all: it is either a cocktail of vitamins and minerals, a sports nutrition or meal replacement product built up from processed constituents, or some other mixture of naturally-derived, refined, or outright synthetic ingredients. We may have encountered pieces of these products in nature at some point, but never at these doses. In certain cases, they are completely new to our physiologies. Take the case of grapefruit seed extract. The FDA has been warning manufacturers of this “natural” antiseptic and antibiotic agent that their products may contain triclosan (an antiseptic linked with bacterial resistance and toxicity); the American Botanical Council suspects that these extracts are adulterated purposefully to increase their antibiotic power (http://cms.herbalgram.org/herbalgram/issue94/QUALCONTROL_gfse.html). Others feel that the extensive processing that the original grapefruit seed slurry undergoes actually generates triclosan-like compounds (http://herbsandinfluenza.com/blog/2006/12/22/grapeseed-extract-explained/). Regardless, you either have an adulterated product (falsely labeled! ), or a product that has undergone extensive chemical alteration, resembling grapefruit seeds less than high fructose corn syrup resembles an ear of corn. This isn’t a natural product at all. So whether it be an antibiotic derived from chemical manipulation, a mega-dose vitamin, a solvent-extracted slurry of connective tissue from a shark, or a digestive enzyme obtained from a genetically-modified Aspergillus fungus, I fear that our “natural” products bear little resemblance to those found on the shelves of natural food stores in the 1980s. Even more disturbingly, most of what’s out there (with a few rare exceptions, like folic acid) shows very little evidence of helping for any problem whatsoever. Where do we see a consistent body of research and a rich depth of traditional use? 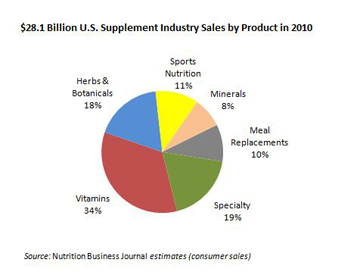 It’s in herbal medicine – less than 1/5 of what’s on the shelves. Most of these other “natural” products are marketed on the basis of petri dish experiments, fruit fly studies from fifty years ago, anecdotal testimonials, or in some cases, just snazzy packaging. Some of them contain toxic, drug-like ingredients. It is no wonder the FDA is trying to get a handle on this situation (as it already has with the amphetamine-like additive DMAA http://www.fda.gov/NewsEvents/Newsroom/PressAnnouncements/ucm302133.htm). It is also no wonder that we are starting to see more and more reports of vitamins, minerals, and other supplements potentially doing us more harm than good: they are at best weak drugs, and at worst untested, potentially unsafe, chemical additives. What put this over the top for me was a discussion I had when I recently visited Bastyr University, the premier training ground for naturopathic physicians in the United States. Out of the 299 credits required for graduation, there are five credits devoted specifically to botanical medicine. Over seventeen are assigned to physical medicine (somatic therapies involving touch, manipulation, etc), and over eight for homeopathy (http://www.bastyr.edu/academics/areas-study/study-naturopathic-medicine/naturopathic-doctor-degree-program#Curriculum). Where are the herbal materia medica classes? Where are the topics on complexity in medicine, the study of interactions between multilayered living botanicals and multilayered living humans? These are the roots of naturopathic medicine, but they seem to be nourishing less and less of the Bastyr curriculum these days. So can we really be surprised that some practitioners recommend abstracted, drug-like “natural” products to their patients instead of teaching them to brew tea and walk in the forest? Natural products aren’t real, folks – but fortunately, herbal medicine is. Herbal medicine is traditional medicine – for over 80% of the world, but for us in the “developed” world, too. Along with ancient somatic and energetic therapies like massage and acupuncture, all tied together by a rich and meaningful mythology, herbal medicine makes up this tradition. Modern alternatives – be they the mainstream technological medicine, or “CAM” technological medicine – are just that: a different choice, some of which is well validated for use in health care, some of which lacks any validation whatsoever. But neither prescription drugs, over-the-counter pills, or that 80% of “natural” dietary supplements can come close to providing the breadth, depth, and accessibility of true traditional medicine. It is time for herbalists to affirm that our plants are not “complementary and alternative” to technological medicine. Our medicine is real, and just as real vegetables are not a complement to frozen dinners and meal replacement shakes, true botanical medicine is not some kind of extra adjunct to pharmaceuticals and surgical interventions. It is a birthright. It is a daily gift. Its memory is visibly encoded in our genetic material. And it is being practiced everywhere, in kitchens and apothecaries, in modern production facilities and improvised forest clinics. We as herbalists – the growers, the clinicians, the wildcrafters, the medicine-makers, the keepers of wortcunning, the storytellers – have been sinking our roots back into the tradition over the last few decades. Now, having moved well past the embryonic stage, and our cotyledons fully unfurled, it is time to rise up and proclaim what makes us unique: we are traditional medicine, we are integrated ecology, we are plants. Argue all you want about what is “mainstream” and what is “alternative” – we as herbalists are neither. We are tradition, we hold the roots. Now let’s stand up and let others know the deal. As Rima Staines simply put it (http://intothehermitage.blogspot.com/2012/01/rise-root.html): rise and root. Think as a plant does: up, up! and down, down! One movement in many directions, many directions with one focus. I am grateful that you are doing the work that keeps (at least some of) the natural products industry real. Thank you for outing this. Natural! Five credits! That is a great article Guido. Your strong herbal voice adds to the pride I feel for being a herbalist. I worked for a few years as a rep for a supplement company to naturopaths, I enjoyed the work but would light up when I met a naturopath that loved herbs and had a apothecary of tinctures and teas. Often though I was told it just wasn't worth the bother that it was just too complicated and laborious. Instead there would be rows of pill bottles with standardized extracts, gland extracts and vitamins/minerals. I have often thought that there is something about the business of alternative/complementary medicine that suffocated the herbalism. Great article. Really glad to have stumbled across your blog, Guido, and a bit serendipitous, too, as I'm about to be making my way back to Vermont for the summer. I've just finished my second year of a Chinese Medicine program nested within a naturopathic college, NCNM in Portland. I can report that, while NCNM's ND program has a reputation for being funkier and truer to naturopathy's roots than Bastyr's program, most of the ND students I've spoken with feel that their "bot med" training doesn't prepare them very well for clinical work. I'd guess that only a small percentage really consider themselves herbalists, though the majority are comfortable slinging mega-dose vitamins and adrenal support complexes. In the Chinese Medicine program, we spend a lot of time learning herbs and formula, but what's lacking is intimate connection to the plants. Luckily there are more and more people like yourself doing the work to start putting Eastern and Western herbal traditions into meaningful conversation. Thanks, keep it up, and hope to run into you this summer at VCIH! Sabra, that's exactly the experience I had at Bastyr. White-coated salesforce presenting lots of "natural" products. For a moment, I felt helpless in the face of the industry - but of course, we're not. Jonny, a Chinese medicine program is inherently more botanical than an ND program. But the point you make - proprietary herbal blends and not so much gardening - is valid for sure. Look forward to seeing you in Vermont. Excellent article - absolutely true and very insightful. So important for herbal medicine to distinguish itself from the pervasive industry of "natural" products. Love this: "True botanical medicine is not some kind of extra adjunct to pharmaceuticals and surgical interventions." Well said. Oh my god I love this. Thank you. Guido, I completely agree with the sentiments of your article and continually work to inspire and change the focus back towards herbalism as you and I understand it. Bastyr actually has 13 credits required plus another 20+ credits of field classes and traditional medicine making available to them. I wish we had had time to speak more about this. Certainly the naturopathic programs tend to lose their herbal focus as the other modalities are added on and it is a constant battle between these modalities and the students personal interests in each one which makes it all the more difficult. More focused programs like our Bachelors program and other's Masters programs help to produce more traditional herbalists but we need more accredited programs to do so to keep it alive and to train herbalists well in traditional herbalism as well as the industry analytical methods do that we can communicate effectively with the FDA. Absolutely, in fact Bastyr is working on some policy changes to decrease the supplement industry's influence on students critical thinking and changing the impression that a supplement will work as well or is easier. We also have a huge curriculum overhaul beginning next year in which 3 quarters of herbal studies have bern added in the areas of history, pharmacognosy and medicine making in addition to 5 quarters of hands on case based herbal formulation studies. These are on top of what we already had in place. So I'm hoping to affect this change we both seek for sure.